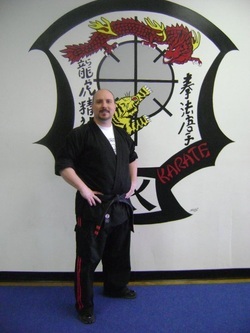 Michael is a native of Montgomery County, Pennsylvania, and has been training in the Martial Arts since 1980. He began his training in Judo, and was a collegiate wrestler. Michael began his Kenpo training in the Tracy system in 1991, but then changed his focus to Ed Parker's Kenpo in 1996 after earning his black belt in the Tracy system. Michael was recognized as a 1st degree black belt in Ed Parker’s Kenpo in 2004 and earned the rank of 2nd degree black belt in 2007. He earned his third degree in 2014. He has also studied in the Filipino stick and knife arts since 1991 and is a certified Basic Instructor in Modern Arnis Jujitsu. Michael is a Freemason of Montgomery County, and serves as the Pursuivant for Shiloh Lodge 558. Michael is available for free community classes for non-profits and demonstrations.